Do I know how to properly pitch a project? Will I settle for self-publishing or no? Do I know precisely what genre I'm writing in, and is the genre found on the shelf, searchable as a category on Amazon? Do I know my comparables and how to best choose them? Have I immersed in my chosen genre well enough to know how it has evolved over the past few years? Will this writer conference be a networking opportunity that puts me in touch with business professionals who will also provide advice on my work? Will this conference be honest with me in terms of reaction and feedback? 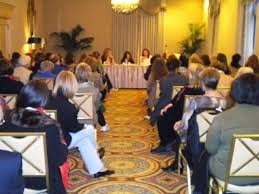 The AWP Conference is one of the biggest and most popular conferences in the writing world. By BEA standards, it's small, but more than 12,000 writers and readers attend annually, with up to 650 exhibitors and a large book fair. Tip: don't buy any books until Sunday because by then the frustrated indie booksellers will practically be throwing them at you. Keep in mind this is mostly for literary writers/authors. If money is tight, genre writers should steer clear. An event held four times a year in the publishing capital of the U.S. for upmarket, literary, and all genre novel-length fiction except for mainstream romance. Features include extensive pre-event novel foundation assignments; attendees allocated to small-group editorial/pitch workshops; one-on-ones with commercial acquisition editors in an environment without timer buzzers or background noise; and each writer's workshop leader present during all pitch sessions for support and project clarifications as needed. Workshop faculty include successful agent-authors and former acquisition editors at major houses. Programming also includes first-page "hook analysis" and the famous/infamous post-pitch drinking fest on early Saturday evening (all secrets revealed--attendance not mandatory). The Santa Barbara Writers Conference focuses on writers honing their craft and networking with other authors. Informative, yes, but for commercial genre writers, networking with publishers and/or good agents is a better idea. But it’s held during the summer in Santa Barbara, and that is a plus due to the terribly beautiful paradise of SB where the moon rises in the east. Of all the conferences that make you feel like your are part of a grand but futile horde, the San Francisco Writers Conference is an event that should not be missed. From the opening gala to over 60 sessions with presenters, as well as 3 minute-timer pitch sessions. If a big conference with lots of agents and panels is what you want, it doesn't get much better (or crazier) than the SFWC. The location on Nob Hill in SF is stunning, and don't miss the parties! This conference is a great place to network with industry professionals and other writers, while learning "everything" about publishing. Expect the usual panels, lectures, one-on-one meetings with editors, and opportunities for authors to pitch books to agents. Pretty much the usual fare, similar to SFWC. If in Austin, a bonus, of course. This conference in New Haven, Connecticut has two sessions; session I is an intensive nine-day long conference for those who wish to explore craft. Session II is for writers who are focusing on a more specific genre. If you’re looking for an intimate workshop, this is a conference that might well impact your writing career. If you can stick it out for such a long time, and afford it, you deserve a medal. This is a conference for networking and learning about the publishing industry, and you get to buy a martini for Chuck Sambuchino! You have arrived. Seriously though, a good event for newbies looking to lay a foundation. This is a conference that shows writers how to get published through conferences, workshops and different literary events ... We're not sure what this means. Best to investigate. This is the longest running literary festival of women in the nation and has over 1,000 attendees per year. At this conference you can get advice on how to improve your manuscript, speak with editors, and connect with other female writers. AWP is fine for academics who share the same views on fiction writing that inevitably fail anyone looking to commercially publish. It's good for academic networking and that's about it. I would recommend BEA over AWP. AWP is fun and on the panels there's something for everyone, but it's not a workshop conference, so it's not really comparable. Why aren't Bread Loaf, Sewanee, and Tin House on this list? Because they're pretentious and way too academic to actually be useful to most novel writers? Why? It's just like the standard disappointing writer conference. Same format, same agents, only more people to jostle with and longer lines to meet a lot of agents who are not really interested in what you're telling them. See the post below by Cheever. I learned this truth after wasting thousands on flying around to attend these things. "Ignore the one on one meetings. I know this is going to be controversial advice, but I’ll stand by it. I don’t like formal author-agent pitch sessions for a couple of reasons. First, most conferences schedule too many of them. If you’re one of the agent’s first pitches you might be in good shape. But if you’re the agent’s 30th pitch in two days, honestly, you would have been better off sending a query letter. As to pitching editors directly, unless you’re writing romance or science fiction, they’re probably just going to tell you to get an agent anyway. Here’s an inside tip on how agents deal with conferences. Most agents are too polite to say “no” to your face. You can pitch them a book that they KNOW—100% KNOW– they would never in a million years sign up. But rather than deal with the pressure of rejecting you to your face, they’ll say something like “Well, I don’t know. For something like this it’s all in the writing.” They’ll ask you to mail them the first three chapters and then they’ll glance at them for about 5 seconds and then pass, politely, with their standard rejection letter." I'll add to the comment above, that they will not glance at them at all after you send in the first three chaps. They'll have their intern "read" it and generate the automatic rejection letter with boilerplate language. This is why we run things so differently at the New York Pitch conference. Our writers are trained to pitch and the environment is conducive to informal talk so that editors don't get stressed. The success rate proves itself. Sewanee is a waste. Unless you are a fellow...It is a drunken feast, with no essence....Tennessee would not be amused. Through my thirty-plus years of writing and attending conferences, I can honestly say that Algonkian's was the best (I love AWP, but it's not a 'working' conference). Once you are to a point in your career where you have a finished product and want to know whether y ou are pitching it properly, Algonkian is the only one that is 'right.' You come away having had conversations based on your work, contact with editors, and knowledge about the industry that you simply do not get anywhere else. Michael's pitch training was well worth the 3+ days--got my story down to the basic "elevator" pitch and then some. Used it at several conferences last year, including the WD's in NYC plus Pacific Northwest Writer's Conference (surprisingly large). Must say that as a (real estate) agent myself I know that if I have a buyer for a specific product, I look for it, so I suppose it's the same with literary agents--if they know "the Big 5" are wanting a particular type of product that's what they will seek. I've learned that you could have the greatest story, great writing, but if it's not worth an agent's time to get the big bucks they won't take you on. I'm looking on my own for a publisher now--even got a good one to send me a contract which I rejected based on terms. It needs to fit or it won't sell anyway . . . I'm not giving anything away. I might be crazy but what does the following (and others) in this 29 conference list have anything to do with rating and listing the best writers conferences? “One phrase we always throw around in our meetings is ‘surprise and delight.’ How can we give people something they aren’t expecting, even if it’s really small? “Things like spending extra money to ensure it’s something people will actually use, having volunteers go around our registration line with sunscreen, or enlisting the help of the unipiper to cruise through the ‘Portland Experience’ with his flaming bag pipes. I would never include Bread Loaf on a list for the simple fact that exporting the MFA model in miniature to extremely expensive week-long (or shorter) writer workshop events packed with amateurs and academic MFA-type authors as workshop leaders is a recipe for failure if you are really looking for anything that resembles serious commercial publication. If you're writing genre, they will pan you. If you're writing literary they will grind you with acidic comments and bake you with fluffy praise that is equally counterproductive, and all in the presence of a workshop leader who has never in his or her life had even minimal exposure to the commercial writing business. I'm a little late to commenting here, but I just wanted to share two that I've been to that are IMHO not worth the price of admission: Wesleyan (June) and Skidmore (July). I spent a fortune attending these. I learned nothing useful. I did however become aware of the Literary Industrial Complex. One attendee compared it to the Payday Loan industry.